And I come to you with a product review! It is always exciting when a trusted brand delves into new territory. 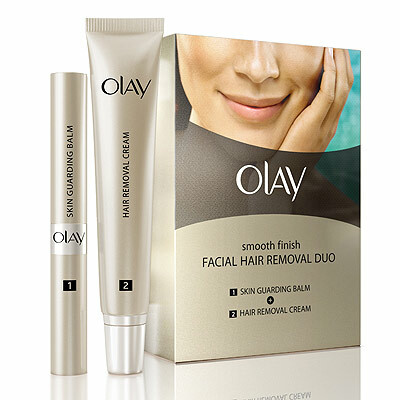 Olay is now offering a gentle way to remove those unwanted facial hairs. Their new Olay Smooth Finish Facial Hair Removal Duo offers a pain-free option. Their two part process includes the Olay Skin Guarding Balm which adds a layer of protection against redness and irritation. Step Two is the Olay Hair Removal Cream which is applied over the balm and within 6-8 minutes will have you looking gorgeous! I have made no secret of my love for Olay products and have been using their lotions since my teenage years. This is a wonderful addition to their line. While some hair removal products have a very pungent smell the Olay version is very light. It left my sensitive skin with no redness. If you are looking for a new hair removal option I give this one my stamp of approval! I started using Olay products when I was 18! (Thanks Mom!) I have tried to use other brands, but always go back to Olay. :) I use there total effects moisturizer. I have very fair skin, so it's nice never having to worry about getting sunburn! Glad to hear a good review, I have been wanting to try this.